Taylor’s Genuine Food and Wine Bar – Hot News!!! To read a bit more, feel free to go back to my May 8th post on the Taylors’ new place. I for one can’t wait! Are you making plans to check it out? Update on June 17th: I called today and they started dinner service today. Will not be doing lunchtime until Monday. Good luck getting in! I think it may be hard to write about my Monday lunch at Domus Café for two reasons. The first is that the purpose for lunch was more about my company than the food. I was the guest of out-of-town friends, visiting our distinguished capital on a mini vacation. Our grande dame at the table was my mother’s maid-of-honour, a dear, dear family friend, who stood with Mom at their wee wedding in Toronto some 54 years ago. With her was her daughter, the catalyst who made the trip possible with her inspiration for a mother/daughter experience to celebrate Mother’s Day. And this lady is worth celebrating. The second reason is that Domus Café has been showered with many accolades from critics and fans alike and to add my observations to all of that just seems pale. I do have to say, I was highly distracted from my food, and the place itself, by our steady conversation as we tried to catch up on the news since our last time together. And of course I am responsible for the tidings of ALL members of the family. I am not as sharp as I used to be when it comes to remembering the comings and goings of very busy people, so where I stumbled on facts, I probably resorted to a bit of poetic license. Always as positive as I could be! All that to say that I hope the pictures from lunch will speak for themselves. One thing that did stand out for me was how the warmth of the natural light streaming in enveloped us. The buttercup yellow on the walls only worked to enhance this effect. The wood on the chairs is a light, warm tone. I am fond of real tablecloths and crisp napkins. We each started with VERY tall cranberry spritzers and 2 slices of very fresh bread for dipping in oil and balsamic vinegar. Many will warn you about eating out on Mondays and the only thing more risky is to then order seafood. Well, risky gals that we are, two of us went for the House Smoked Trout and Yukon Gold Potato Rosti with Terre a Terre greens, Vers Jus mustard crème fraiche and cranberry relish. Standouts were the potato rosti. Tender yet crisp. The greens seemed like they had just been picked at the time of plating. (I get really fussed about fresh greens. Any hint of a composting salad just sets me off.) With conversation very much in the foreground, I just didn’t find the opportunity to ask what was in the cranberry relish. There was something with a kick. 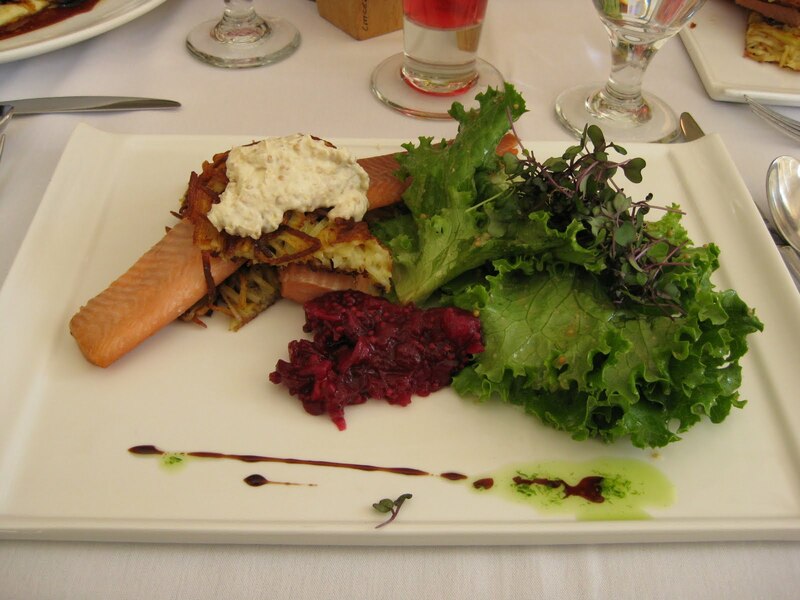 The trout was not heavily smoked and balanced well with the punch of the mustard crème fraiche. The third lunch was the Berkshire chorizo sausage with polenta, mushrooms, tomato relish and greens. Not being familiar with the chorizo sausage, the spicy dryness that is its signature, ended up being a spoiler. Unfortunate, as we rushed to get our order in. I could have helped out on that one since my son is a chorizo fan and I knew of its acquired taste. The tomato relish got high praise! 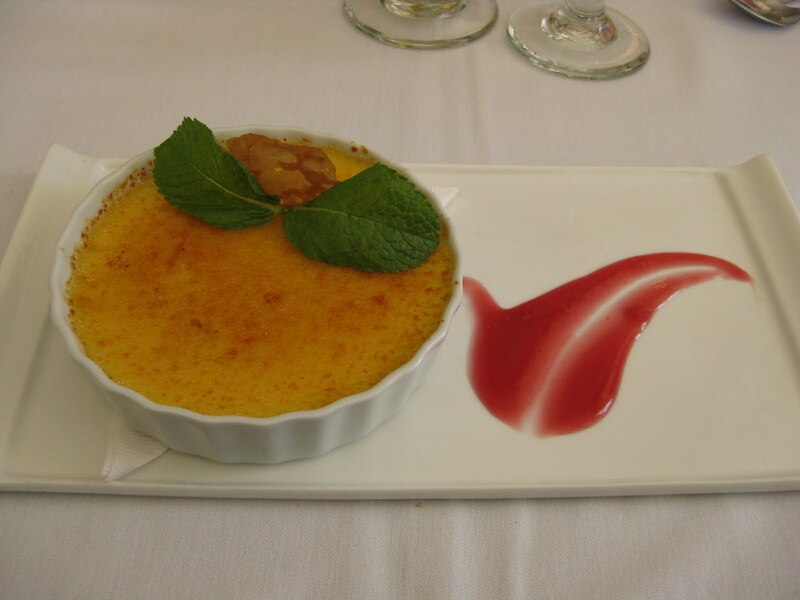 I decided to go for the “Classic” Fresh Vanilla Bean Crème Brulée. It was delicious with the little blaze of rhubarb coulis decorating the plate. 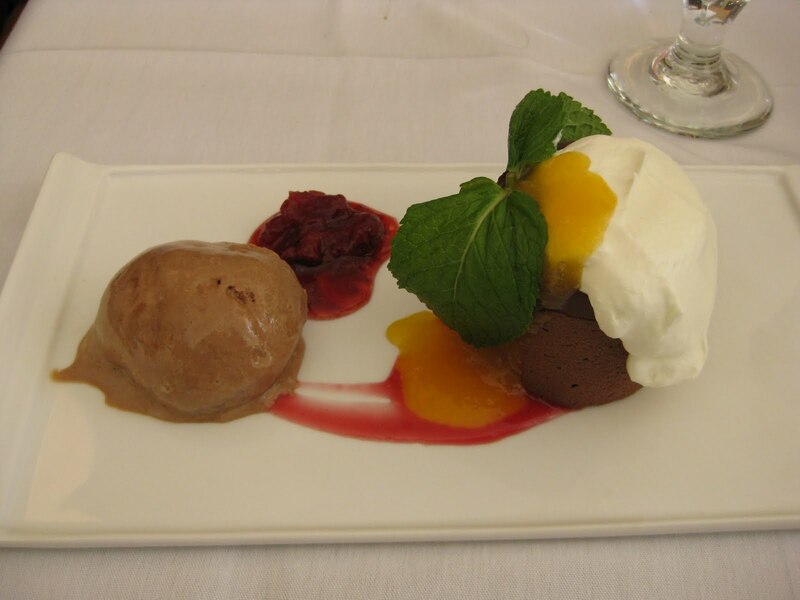 The second dessert at the table was the Domus House Classic “Mini” Truffle Cake with Dark Chocolate ice cream, Niagara strawberry compote and fruit coulis. And the ‘third’ dessert was tea! Our two hours together just flew by. I suspect that happens at Domus often. Being Monday, I was a bit surprised to see the place packed. I noticed a few familiar faces from the media and the Hill, but I kept those observations to myself. I think our guests to Ottawa were more into shopping this trip than the sizzle of federal politics. Chris Knight named Domus Café #1 in 2009 on Ottawa Magazine‘s Top Ten list of Best Restaurants in Ottawa (and #2 spot in 2008). 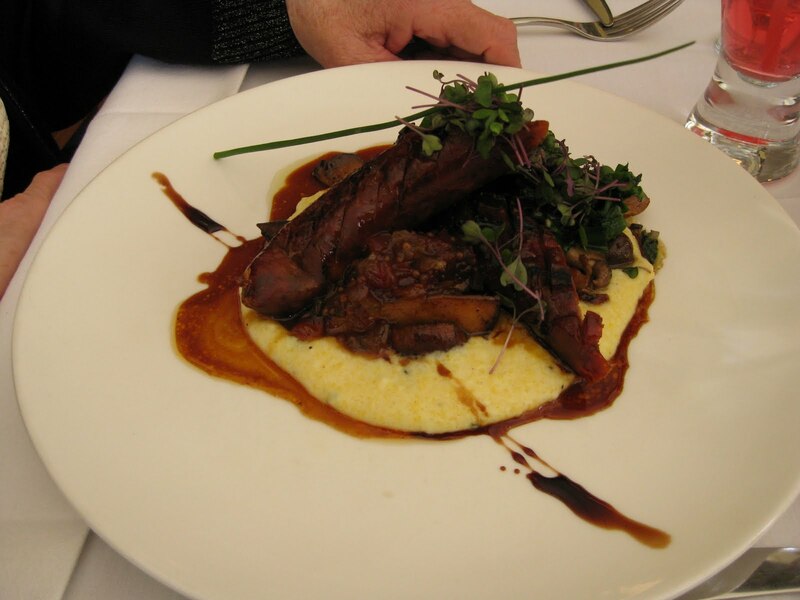 Domus Café has garnered a reputation for Canadian regional seasonal cuisine. And again they delivered. Chef/owner John Taylor and his wife Sylvia, sommelier and co-owner, have really made a name for themselves with all their hard work at Domus over the past 15 years. Is anyone interested in trying their new, soon to open, venture in Old Ottawa South called Taylor’s Genuine Food & Wine Bar? I for one, can’t wait! I have two very special friends coming to town tomorrow and we are lined up for a lunch date on Monday. I was asked to pick the spot since this is my town. When I started to ponder this weighty decision a week or so ago, I had secretly hoped that Monday would see us sitting at Sunnyside and Bank, enjoying our lunch at Taylor’s Genuine Food & Wine Bar. As the launch is still days away, to get our fix of chef John Taylor, we will instead be nestled in at his Byward Market establishment, Domus Café at 87 Murray Street. Ottawa is not a town my visitors come to often, so I hope that this experience will give them a taste for the depth of our culinary landscape here in the nation’s capital. As you can imagine the opening of Taylor’s Genuine Food & Wine Bar is much anticipated and I too am on that list of those keenly waiting. There have been some great articles written up recently and I invite you to read more about this new additon to Old Ottawa South’s food scene. Our New Wine Bar by William Burr published in the May edition of The OSCAR. Page 9. It’s Genuine: John Taylor’s Food and Wine Bar by S. Bergwerff published on May 5th. Here’s the exclusive inside look at John Taylor’s new resto — Video by Ron Eade posted on his blog Omnivore’s Ottawa on May 7th. For John Taylor, with all this interest, it must feel like a pretty nice way to start into this end of Ottawa.